This pattern is the first one I ever designed specifically for a certain brand of yarn. I normally always use Red Heart Comfort yarn for my amigurumis. This pattern was designed using Red Heart's newest yarn called, "Soft Essentials". It's soft on the fingers while crocheting, which I love! Soft Essentials is exclusive to Michaels Stores or Red Heart's website. Bear is about 6.5 inches tall sitting and 9.5 inches tall standing. This pattern uses one full skein, see the rest of the supplies list below. 4.5 mm hook *do not use a bigger hook unless you have an extra skein handy. EYES: If you plan to use safety eyes, these are placed between the 10th and 11th row with about 6 visible stitch holes between them. I put a piece of white felt behind mine, that is optional. Do what you think looks best to you. 16) 1sc in next 5st then 2tog (36) *if you start to see gaps while you decrease then try the inv dec by crocheting in the front loops only when crocheting 2tog. *stuff head. Shape while stuffing. Install safety eyes, if you're using them, before stuffing. *stuff and shape body. Be sure to fill any stuffing gaps in the neck. You can add more stuffing in after you finish row 34.
sl st next st and f/o leaving a long tail for sewing. Whip stitch a nose onto the muzzle. Pull yarn color of choice through center hole of row 1, wrap it over 2 rows in the shape of a V. Keep wrapping until you are happy with the size of the nose. I wrap until it becomes too difficult to push my needle through the center hole. Finish off with a straight line, down the middle under the nose, over 2 rows. Knot off the yarn tails inside the muzzle and tuck them inside. See the assembly section below for the stuffing instructions. 2) 2sc in each st (12) *work starting yarn tail into this row. I added a piece of canvas fabric to each ear. I used hot glue. If you add felt or canvas, do this after the ears are sewn on. If you do it before, be sure to leave room at the bottom edge for the sewing needle. 7-16) 1sc in each st for 10 rows *stuff hand once you got 2 or 3 rows done. sl st next st and f/o leaving a long tail for sewing. Lightly stuff arm. 12-18) 1sc in each st for 7 rows *stuff and shape foot after you get 2 or 3 rows done. Shape the foot, don't make it into a ball. See photos. stuff leg then sc until you get to the side of the leg. Fold flat then sc through both sides of the leg to close up the top of the leg. ch1 turn and sc across again then f/o leaving a tail for sewing. sl st next st and f/o leaving a tail for sewing.See assembly below for stuffing instructions. Some people find sewing amigurumis together a bit daunting. I used to as well, I used to dread sewing things together! I enjoy it now. The trick is to relax, don't hold things so tight. Let the yarn needle do all the work. Use pins to hold things in place, use lots of pins when you can. Always make sure you are happy with the placement of things BEFORE sewing. 1) Sew the legs on first. The flap of the leg should be fully under the belly and positioned so that the legs sit out as pictured. 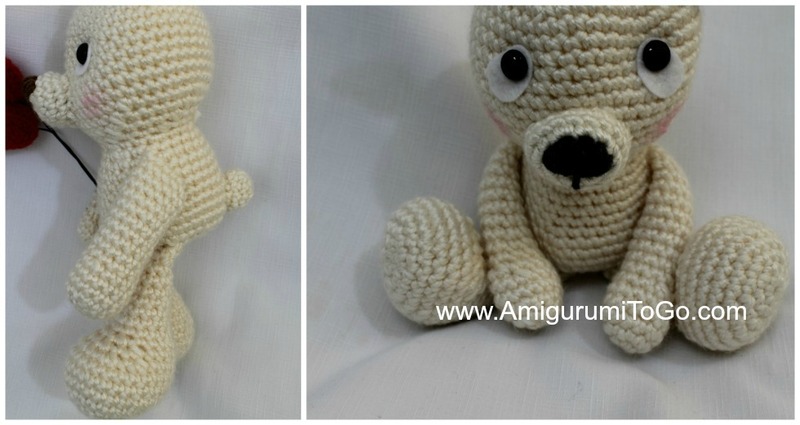 Sew both rows of flap to the bear so that the flap is completely sewn to the bear. 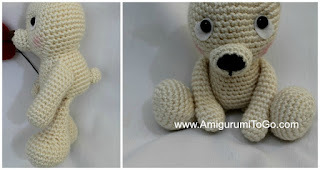 The legs should fall freely downward when you hold the bear up and sit easily when you put it down . Knot off and hide yarn tails inside body. 2) sew the arms on. The arms should be sewn on a slant so that the top edge is on or about row 22 and the bottom edge on or about row 25. The arms should be able to sit without aid in front of the bear, between the legs. Knot off and hide yarn tails inside body. 3) sew the tail on. 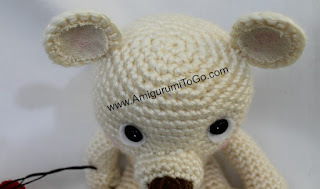 Where you position the tail is very important as the tail will help the bear sit up without falling over. The top of the tail should be on or about row 27 and the bottom edge of the tail on or about row 29. Use pins to hold the tail in place, sew around the tail but leave a small gap for stuffing. Use the back end of a pencil to stuff the tail then finish sewing up the gap. Knot off and hide yarn tail inside body. 4) sew on the muzzle. Stuff part of the muzzle then use lots of pins to hold the muzzle in place. The top edge of the muzzle should be on or about row 13 and the bottom on or about row 17. Sew around the muzzle but leave a small gap for stuffing. Use the back end of a pencil to stuff and also shape the muzzle. Take your time! Once you are satisfied with the looks of the muzzle, sew up the remaining gap, knot off and hide yarn tail inside head. 5) sew the ears on. These are sewn on or about rows 7 and 8. After the ears are sewn on, glue on a piece of felt or canvas. You can add a bit of blush to the ear for added color. 6) You can add a bit of blush on the cheeks for a little bit of color. 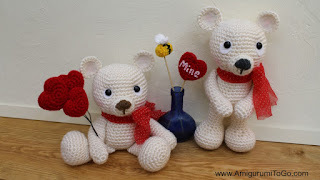 The add a ribbon to finish off your bear! 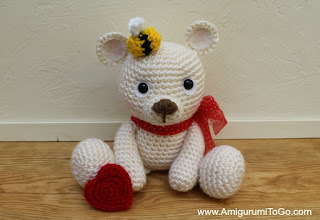 The heart pattern is here and the Bumblebee pattern here. It turned out so beautiful, I can't wait to make one!